When did the Kingdom of Kongo form? By 1500 AD, the Kingdom of Kongo had been around for more than a hundred years and it was doing great. What did the kingdom of Kongo trade? People in the Kingdom of Kongo were selling ivory, iron and copper pots, pottery, and raffia cloth north to West Africa, and east to Tanzania, and they were buying cotton cloth, steel knives, and Islamic and Indian medicines from traders. How big a city was Mbanza Kongo? Along the Atlantic coast, people were building houses out of mud-brick. 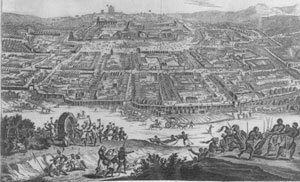 Mbanza Kongo, the capital city, was as big as many European or Indian towns, though not very many people lived in the countryside. Portuguese explorers sailed to Mbanza Kongo in 1483, and some important Kongo men sailed back to Portugal with them to check it out. When the men came back, two years later, they brought Christian missionaries with them. In 1506 the Kongo king Nzinga a Nkuwu became a Christian himself. Some of the men who had learned to read opened a school. Nzinga’s son, Afonso I, made Christianity the main religion for his whole kingdom, and his son Henrique was educated in Europe and became a bishop. 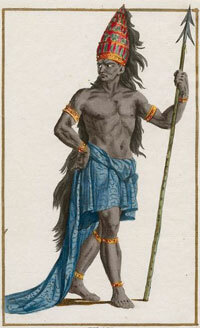 But Afonso also sold a lot of people – mostly his enemies – to Europeans to be enslaved on Caribbean sugar plantations. In the late 1600s and 1700s, Portuguese governors of Angola, to the south, attacked Kongo because they wanted more and more slaves to work in Brazil. The kings of Kongo fought the Portuguese off, but there was a lot of violence and civil wars. In the late 1800s, this all fell apart. First Portugal got control of the Congo in 1891. Then King Leopold of Belgium decided to take over the Kingdom of Kongo and loot it to make himself and Belgium richer. He forced people in Kongo to harvest tons of rubber for him. When did Kongo become independent? Finally, the people of Congo forced Belgium out and got their independence back in 1960. Most people in Kongo are still Catholics. But the United States has worked to keep Congo undemocratic, and the country – sometimes known as Zaire – still hasn’t become as stable as it was before colonization. Cite this page: Carr, K.E. History of the Kongo. Quatr.us Study Guides, May 23, 2017. Web. April 22, 2019.